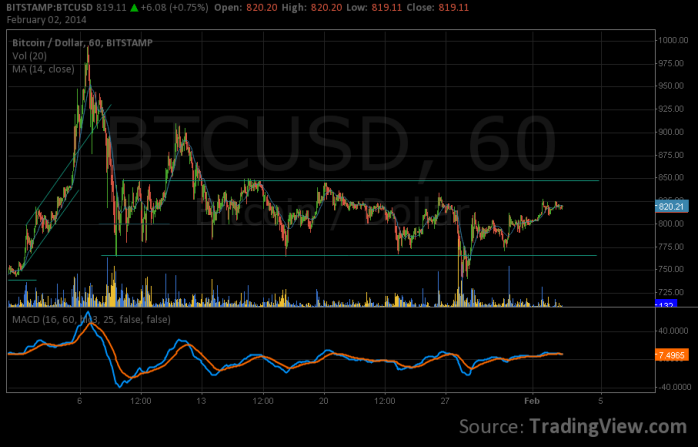 The past week in the Bitcoin markets played out quite as predicted in last week’s analysis. The price of Bitcoin has remained relatively flat over the week at approximately $800, except for a brief fall to $725 before making a quick recovery. Bitcoin is still trading in the $765 — $850 range as it was for about a month, the fall to $725 on Tuesday being a false breakout. This fall can be attributed at least partly to panic caused by the arrest of Charles Shrem for money laundering in collaboration with Silk Road, using his Bitcoin exchange, Bitinstant. Charles was Vice Chairman of the Bitcoin Foundation, and his involvement in money laundering severely hurt the reputation of the Foundation and Bitcoin in general. The Chinese Bitcoin exchange, BTC China has quietly started supporting direct bank deposits and withdrawals in CNY from January 30th. The reflects a belief that the PBoC (People’s Bank of China, China’s central bank) allows banks to maintain bank accounts of companies dealing in Bitcoin. Although this is not entirely clear in the December 5th PBoC notice, other exchanges such as Houbi were operating in this fashion for a month, without any regulatory issues. Assuming no more bad news will come from China, the Bitcoin price is still expected to rise slowly and steadily over the next week, reflecting an increased confidence in the market, both from Chinese and Western investors. The coming week will be quite crucial in terms of news from China, especially the PBoC. In other news, the New York State Department of Financial Services conducted a series of hearings with prominent investors, prosecutors, lawyers, and academia concerned with Bitcoin, in a fact-finding session which will be the basis on which the plan to carve out state regulations for Bitcoin and related businesses. The hearing are very interesting and informative, and are recommended for those who wish to form an informed perspective on the future direction of U.S law regarding Bitcoin. The Hong-Kong based Bitcoin exchange Bitfinex, popular among short-term Bitcoin traders, updated their trading and liquidity swapping engine, their interface with Bitstamp, as well as their API. Details of this update are available here.